I have to say that ever since I heard that Tyranids were going to be redone and I have been super excited to get back into 40k after an almost 8 month break. I kept thinking how we were finally going to get a book that fixes all the obvious and glaring issues with our current Codex and hopefully bring us back into the fold of relevance (seriously, tournaments see more SISTERS players then Nid ones sometimes lol). I had been ravenously following all the rumors, talking to friends who are “in the know” and everything was pointing towards a great book. Huge point drops for almost everything, “Apex Biomorphs” with some awesome effects, rumors of a Troop Transport bug, fixed Trygon tunnel and a Data Slate that focuses on Genestealers and Lictors. Everything sounded awesome. You see, listening to those rumors was everyone’s first mistake as 99% of them were complete “bs” and nothing more than massive amounts of wish listing. As you can probably guess by now I am clearly not a fan of the new book. I will freely admit part of this disappointment has nothing to do with the actual book itself and has a lot to do with what I hoped this book would be. I heard many rumors that Phil Kelly was the writer on this book. I had also read interviews over the years where he was (supposedly) saying he had tonnes of ideas for a new Tyranid codex and how he feels the Design Team hadn’t fully captured what this army should be about. With that in mind following the trend of the rest of the 6th ed codices that are basically just updates of their previous books I was hoping that the 6th ed Codex would be an updated version of the 4th ed Codex as Kelly wrote that book. Now, I don’t mean full of adjustable stats and weapons that are based on the parent unit’s strength (which WAS really cool lol). What I do mean is restoring those iconic units and weapons to their rightful place. A good example of what I am talking about is if you read the Deathspitter fluff. Even in the 6th ed Codex, it mentions that the weapon fires larvae that explodes in a shower of acid when it hits its intended target. Now, which rules reflect that description better? A rapid fire gun that fires individual bullets…or a single shot blast weapon? It honestly never occurred to me that they would just update the 5th ed codex instead, which if you think about it is pretty obvious that is the direction they would take. This entire mode of thinking is 100% on me as a player and probably making it so anything that ISN’T what I hoped for would lead to disappointment. Alas, just points 1) and a few units for point 2) were addressed. Literally everything else was ignored. The worst part is virtually all of those points are obvious to anyone who actually used the 5th ed Codex for any length of time. All of this now brings me to the actual 6th ed Codex. The new book is such a weird codex to me. Almost every single buff or positive change was coupled with a negative change. Some Monstrous Creatures got a point cost reduction but all of them have virtually the exact same stats regardless of their role (everything is WS3, 3 attacks, doesn’t matter what it is) as well as expensive upgrades. Gants got a point decrease then you realize they have ludicrously expensive upgrades which 100% offset their point reduction and in many cases make them MORE expensive than last edition. Certain key units received MASSIVE nerfs and/or MASSIVE point increases (Tervigon, Tryanid Prime and Hive Guard specifically). The Tervigon though is the one that really stands out. Not only did they increase the cost by 35pts, they also tripled the Termagant requirement to make them troops, doubled the radius of their “kill zone” to Termagants when they die, removed virtually all the synergy between themselves and Termagants and also neutered their spell casting ability. Now something obviously needed to be done with Tervigons as they were out of control last edition and you can totally count me as a person who loathed the “Tervigon Spam” armies. I think just increasing their points and increasing the Termagant requirement to make them troops would have been more than enough. They finally allowed two sets of CC weapons to give a bonus attack which was awesome…only to removed virtually all special rules from CC weapons, reduce the number of attacks by one on all dedicated CC creatures AND made it so multiple weapons no longer stack effects (something which has been a Nid trademark since the dawn of time). I was also hoping that they would remove all the stupid “Special Characters” as I found them very un-fluffy in an army whose defining trait is being a faceless unstoppable force so I was happy to see them go. I wasn’t happy to see the Mycetic Spore go though as it greatly reduces our armies deployment options totally killing my favorite play-style. The list goes on and on but I am sure you get the point. Honestly I would be fine with all of that if there were some new special rules that were really cool. Something that just grabbed you, made you excited about the book that would really make you want to sink your teeth into this army. Nothing. No special rules other than an incredibly punishing Instinctive Behavior which oddly enough I kind of like from an imagery/fluff perspective. Where is our version of Battle Focus, chapter tactics, warp storm table (okay, bad example lol), etc? Where are the new rules to help off-set all the massive penalties this book puts on its players in relation to having no access to allies, rule book powers or being able to use emplaced weapons (don’t worry Nid fans, it will be FAQ’d shortly to this effect). I know for me this, more than anything, is why I am as disappointed as I am with this Codex. It’s not that I don’t think I can win with it or make competitive lists, I know we can, it’s just that the book is incredibly un-inspired and incredibly boring and bland. When reading through it nothing jumps off the pages screaming “I have to try that build!” I just look at the codex and shrug. With all that being said this is still my favorite army in any game system. It has easily one of the strongest and most complete model ranges of any army out there and this alone will keep my coming back and playing the army. 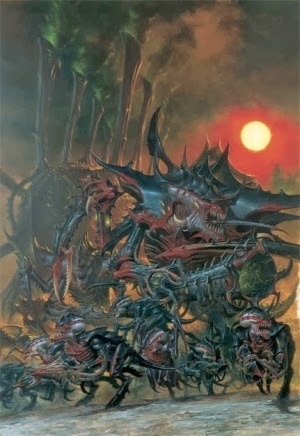 There are also a handful of great things that are still in this book like the revised psychic powers (I know some hate them, to each their own), shadow in the warp which is officially the best psychic defense for any 6th ed codex and the ability to field a very fun Horde army if you go bare bones on all the gant species. Despite how this article comes off I am not trying to add to the massive number of “Whining Tyranid Posts”. 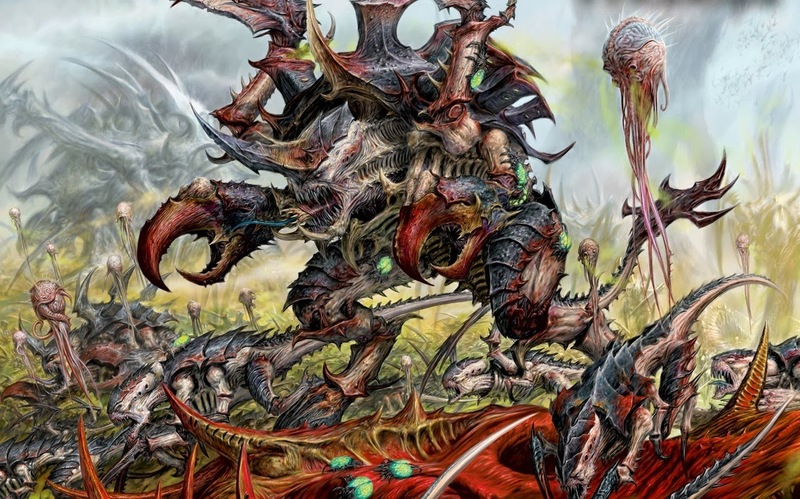 The point of this article is just try to explain why this long time Tyranid player (and after reading a whole slew of articles other Nid players as well) aren’t as pleased as we think we should be with the most recent Codex. I honestly think if people didn’t listen to the rumors which greatly increased their own personal expectations the overall level of hate would have been greatly reduced. I think this holds true for all of GWs releases. Everyone just has to accept that moving forward, especially due to the release schedule, that all the remaining 6th ed Codices are just going to be re-writes of their previous books with mostly minor changes and updates. A good perspective, as another long time bug player, I think you hit it on the head with what went wrong. Also, might want to add some pictures to break things up a bit.